What does being an outdoor, living museum mean? Visiting Mid-Continent is different than a standard museum experience. In addition to typical indoor and outdoor museum exhibits, being a “living museum” also means being able to experience these historic machines up close… seeing a train’s inner workings, hearing the whistle echo across the valley, and feeling the ground shake as the trains pulls into the station. 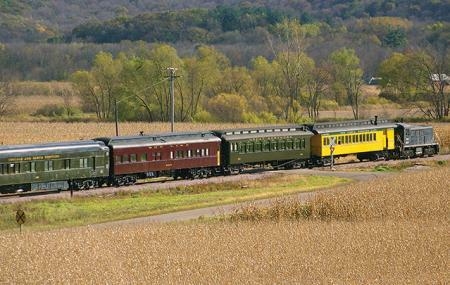 Mid-Continent offers an educational 55-minute train ride using vintage equipment, some over 100 years old. This train is not a miniature or toy train, rather a full-sized passenger train like our grandparents rode in a bygone era. The train operates on the historic spur line that runs from North Freedom to the La Rue iron mining district. Tell us about some of the new developments at the museum. In 1999 work began on rebuilding our featured steam locomotive C&NW #1385. The locomotive was built in 1907 and needed a complete rebuild to bring it back to its former glory. The restoration will be completed in the fall of 2018 at a cost of 1.2 million dollars. One of the necessary items to protect restored wooden rail cars is to keep them inside a display building. In summer 2018 Mid-Continent is opening a new 10,500 square-foot display shed. This new $950,000 structure has three spur tracks inside to store rail cars and locomotives. When the railroad must cross a river or creek, a railroad bridge is necessary. In 2004 the bridge over the Baraboo River was removed from service due to age and deterioration. Replacement of the bridge was important because it serves as a vital link to the national rail system as well as enhances the museum’s train operation. The new bridge project was started in January and will be ready by summer 2018, at a cost of $677,000. What is the best compliment or review you’ve received from a patron? Mid-Continent has been offering train rides to families since 1962. It is not uncommon for parents and grandparents to tell us that they first visited as youngsters themselves and now are returning with their children and grandchildren. What would you like people to know that aren’t familiar with your business? One patron that had a difficult time finding us said “Mid-Continent is the best kept secret in Wisconsin”. A high ranking elected State official once said “Mid-Continent is a jewel in south central Wisconsin”. Because we are in a rural area, sometimes it is difficult for visitors to locate the Museum. According to some of our peers, Mid-Continent has one of the best collections of steam locomotives, wooden passenger, and freight cars. Why do you partner with the GMCVB? Mid-Continent is the closest operating railroad museum to Madison – an easy one-hour drive from the isthmus – but just far enough away to make us out-of-sight to much of the public. Our non-profit nature means we have a very modest marketing budget, so we must make sure every marketing dollar counts. Partnering with GMCVB helps raise awareness of our existence to an audience that we simply couldn’t reach all on our own. We’re extremely happy with all the major improvements we’ve made and are continuing to make to our museum this year, but there is another vitally important project coming up. We’re currently launching a capital campaign to replace the Museum’s other bridge, the Seeley Creek Bridge at La Rue. The wooden bridge was constructed in 1927 by the C&NW Railroad and years of deterioration have taken their toll. Replacement of the bridge is estimated by a bridge engineer to cost $824,000. If the capital campaign is not successful, the impact of losing this bridge will cut the ride length in half, severely affecting the Museum as a whole. Takeout location offering homemade food at reasonable prices. Open Mon-Fri 7 a.m. - 2 p.m. Enjoy fresh soups, entrees, bakery and salad bar daily. Also offering catering for breakfast, lunch and box meals! Dave & Buster’s is the ONLY place to Eat. Drink. Play. Watch Sports. 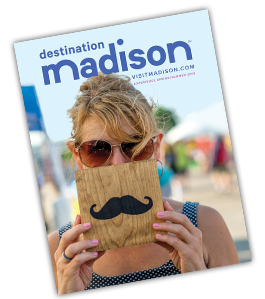 The most fun you’ll have in Madison! Now open at West Towne Mall. Enjoy waterfront dining on beautiful Lake Mendota at Captain Bill&apos;s featuring fresh seafood, chicken, pasta, and steak served in a rustic, casual Key West setting. Experience our outdoor deck or our circular indoor fireplace. Experience upscale elegance and comfort at the Holiday Inn Express Hotel & Suites in Verona. Located just 10 minutes from Madison, our hotel provides a complimentary local area and airport shuttle, indoor pool, state-of-the-art fitness center, and our complimentary hot breakfast bar, among many other amenities. Stay with us tonight!